Create an internal load balancer for SQL Server availability groups using PowerShell cmdlets. 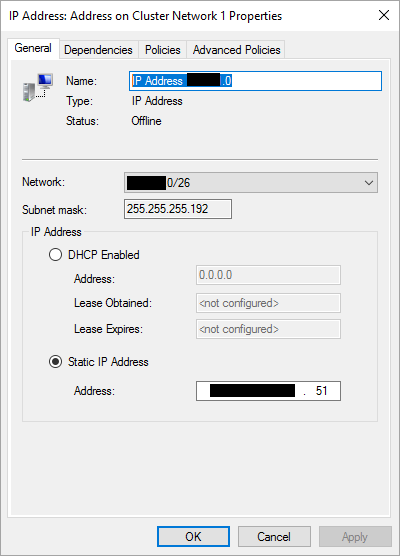 Add additional IP addresses to a load balancer for more than one availability group. An availability group listener is a virtual network name that clients connect to for database access. On Azure virtual machines, a load balancer holds the IP address for the listener. The load balancer routes traffic to the instance of SQL Server that is listening on the probe port. Usually, an availability group uses an internal load balancer. An Azure internal load balancer can host one or many IP addresses. Each IP address uses a specific probe port. This document shows how to use PowerShell to create a load balancer, or add IP addresses to an existing load balancer for SQL Server availability groups. The ability to assign multiple IP addresses to an internal load balancer is new to Azure and is only available in Resource Manager model. To complete this task, you need to have a SQL Server availability group deployed on Azure virtual machines in Resource Manager model. Both SQL Server virtual machines must belong to the same availability set. You can use the Microsoft template to automatically create the availability group in Azure Resource Manager. This template automatically creates the availability group, including the internal load balancer for you. If you prefer, you can manually configure an Always On availability group. This topic requires that your availability groups are already configured. Run the Connect-Az Account cmdlet and you will be presented with a sign-in screen to enter your credentials. Use the same credentials that you use to sign in to the Azure portal. If you have multiple subscriptions use the Set-AzContext cmdlet to select which subscription your PowerShell session should use. To see what subscription the current PowerShell session is using, run Get-AzContext. To see all your subscriptions, run Get-AzSubscription. The examples in this article are tested using Azure PowerShell module version 5.4.1. Verify your PowerShell module is 5.4.1 or later. See Install the Azure PowerShell module. Configure the Windows Firewall to allow SQL Server access. The firewall rules allow TCP connections to the ports use by the SQL Server instance, and the listener probe. For detailed instructions, see Configure a Windows Firewall for Database Engine Access. Create an inbound rule for the SQL Server port and for the probe port. If you are restricting access with an Azure Network Security Group, ensure that the allow rules include the backend SQL Server VM IP addresses, and the load balancer floating IP addresses for the AG listener and the cluster core IP address, if applicable. Azure load balancer is available in 2 SKUs: Basic & Standard. The standard load balancer is recommended. If the virtual machines are in an availability set, basic load balancer is permitted. Standard load balancer requires that all VM IP addresses use standard IP addresses. The current Microsoft template for an availability group uses a basic load balancer with basic IP addresses. The examples in this article specify a standard load balancer. In the examples, the script includes -sku Standard. If you created your availability group with the Microsoft template, the internal load balancer was already created. The following PowerShell script creates an internal load balancer, configures the load balancing rules, and sets an IP address for the load balancer. To run the script, open Windows PowerShell ISE, and paste the script in the Script pane. Use Connect-AzAccount to log in to PowerShell. If you have multiple Azure subscriptions, use Select-AzSubscription to set the subscription. To use more than one availability group, add an additional IP address to the load balancer. Each IP address requires its own load balancing rule, probe port, and front port. The front-end port is the port that applications use to connect to the SQL Server instance. IP addresses for different availability groups can use the same front-end port. For SQL Server availability groups, each IP address requires a specific probe port. For example, if one IP address on a load balancer uses probe port 59999, no other IP addresses on that load balancer can use probe port 59999. For information about load balancer limits, see Private front end IP per load balancer under Networking Limits - Azure Resource Manager. For information about availability group limits, see Restrictions (Availability Groups). The following script adds a new IP address to an existing load balancer. The ILB uses the listener port for the load balancing front-end port. This port can be the port that SQL Server is listening on. For default instances of SQL Server, the port is 1433. The load balancing rule for an availability group requires a floating IP (direct server return) so the back-end port is the same as the front-end port. Update the variables for your environment. Get the name of the cluster network resource. a. Use RDP to connect to the Azure virtual machine that hosts the primary replica. b. Open Failover Cluster Manager. Add the client access point. The client access point is the network name that applications use to connect to the databases in an availability group. 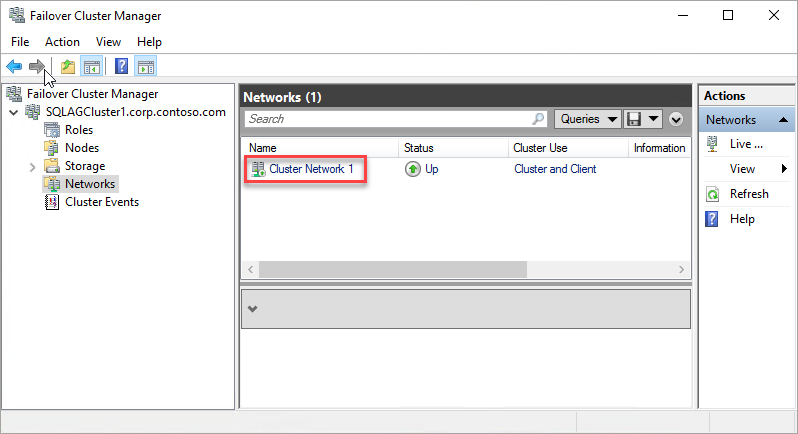 Create the client access point in Failover Cluster Manager. a. Expand the cluster name, and then click Roles. b. In the Roles pane, right-click the availability group name, and then select Add Resource > Client Access Point. c. In the Name box, create a name for this new listener. The name for the new listener is the network name that applications use to connect to databases in the SQL Server availability group. d. To finish creating the listener, click Next twice, and then click Finish. Do not bring the listener or resource online at this point. Take the availability group cluster role offline. 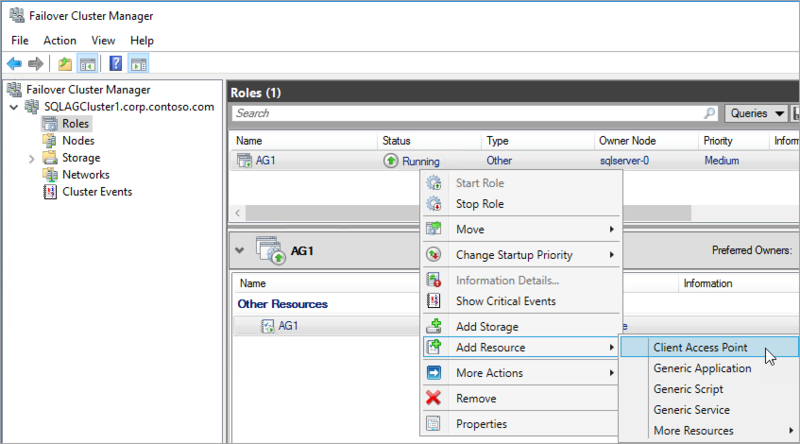 In Failover Cluster Manager under Roles, right-click the role, and select Stop Role. Configure the IP resource for the availability group. a. Click the Resources tab, and then expand the client access point you created. The client access point is offline. b. Right-click the IP resource, and then click properties. Note the name of the IP address, and use it in the $IPResourceName variable in the PowerShell script. c. Under IP Address, click Static IP Address. Set the IP address as the same address that you used when you set the load balancer address on the Azure portal.